A retractable leash is not so much a leash as it is a length of thin cord wound around a spring-loaded device housed inside a plastic handle. The handles of most retractable leashes are designed to fit comfortably in a human hand. A button on the handle controls how much of the cord is extended. Retractable leashes are popular primarily because they aren’t as confining as regular leashes, allowing dogs more freedom to sniff and poke around on walks. But unfortunately, there are many downsides to this type of leash. There is a warning right on the handle to take caution with your fingers. Fingers have been amputated when entangled in these leashes. Humans have suffered serious rope burns and deep gashes as well. 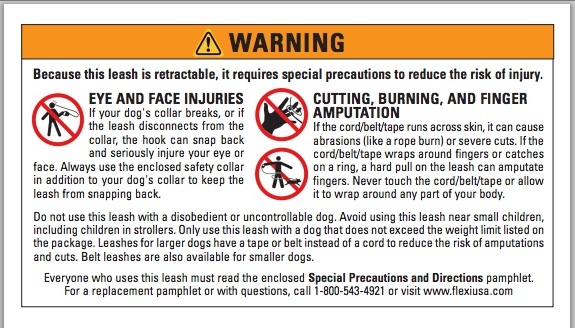 Horror stories of injuries, even amputations, caused by retractable dog leashes have circulated on dog owner boards and forums for years, leading some owners to stop using them. The leashes typically feature a plastic handle with a locking mechanism that allows owners to control how far their dogs can roam. They’re usually made from cord or ribbon-type material that has been blamed for severing fingers as well as burning or lacerating the skin of both dogs and humans who have the unfortunate misstep of getting tangled in them. 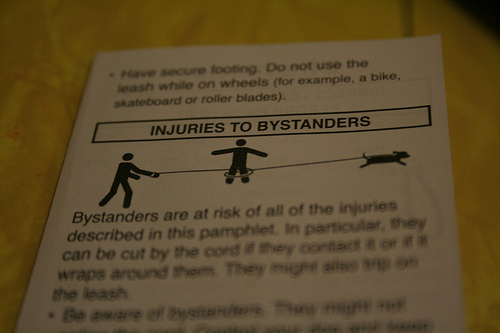 Injuries reported from the SlyDog leash include facial cuts, broken teeth, eye injuries and a broken collarbone, according to the U.S. Consumer Product Safety Commission’s recall notice.